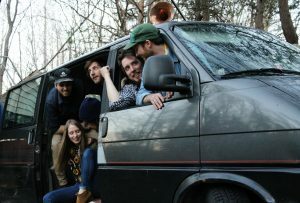 CHSR-FM 97.9 | Jared Durelle chats with Caribou Run about new release, Old PeninsulaJared Durelle chats with Caribou Run about new release, "Old Peninsula"
Maritime band Caribou Run of Nova Scotia has released their second studio album Old Peninsula. Recorded at The Old Confidence Lodge in Riverport, Nova Scotia. The album is performed by Danielle Noble (Vocals, Keys), Drew Moores (Vocals, Guitar), Corey Thorpe (Vocals, Guitar), Jonathan Barkhouse (Drums), Peter Visser (Bass), and Mike Brunelle (Trombone, Vocals). The album features guest performances by Ken Voita, Rebecca South, Nik Field, Mark Adams and it was recorded by Diego Medina. Old Peninsula is a testament to neofolk as a genre of traveling troubles and triumphs. With the bluesy stories of misfortune and addiction coming from tracks ‘Silvia’, ‘Roll on’, ‘Mr. Rye’, ‘Fleeting Soul’, and ‘Money’ there are emotional jams backed by impressive and invasive instrumentals. The tone of the album is hopeful and grown from lament as tracks like ‘Wish You Well’ and ‘PEI’ capture adventurous connections. The most popular track ‘Carney’s Crossing’ is a percussion-fueled tragedy that barrels forward through steady rhythm and a constant refrain to the chorus of “…Meet me down at the railway crossing…”. Caribou Run’s Old Peninsula invites you into a truly beautiful adventure into the calming lament of lives lead a well as thought on roads to be tread. With a music video in the works and tour dates set the band is investing itself in growth and you should be investing your time into them. The overarching theme was born out of the bands Western Shore retreat after proving themselves with their first album ‘Something Organic Will Happen’. With its opener being the lament filled ‘Silvia’ where a single street is brought to life through an emotional call with no response except for the trombone and percussion filled instrumental which flows perfectly into the washboard back and forth of ‘PEI’. Caribou Run expose an emotional and spirited trip but it retains the fun cohesiveness that the group used to put together the album in the first place. The closing somberness of ‘Wish You Well’ holds the same calming passion of a sunset from some warm day long ago as themes of survival and the album’s namesake is revealed to be home of memories of heartache and soul. The album is best enjoyed whenever one wishes to let life in and hear music that is real in meter, measure and mature melody as the band captures both technical and thematic brilliance. May the sun also rise as Old Peninsula shows that Caribou Run can stand out on the East Coast. In their words, this is an interview with Caribou Run. What could you tell me about developing it? Old Peninsula seemed to come together really naturally and it was a very collaborative project by all of our band members. After the release of our first album “Something Organic Will Happen” in 2017, we started playing around with new material for fun, and ended up coming up with some stuff that strayed slightly from our original sound. We rented a house in Western Shore last October for a two day writing retreat, taking the time to sift through the rough material to see what resonated with us. We also brought some really old stuff back to the table that we hadn’t looked at or played in years, and re-wrote them to fit with the album. It was the first time we had actually dedicated time to song writing as a group, and we even surprised ourselves with what we came up with. A good friend of ours, Diego Medina, recorded the Old Peninsula album. His studio, The Old Confidence Lodge is in Riverport, Nova Scotia, and we have spent time jamming there and going to shows over the past few years. The location was a great backdrop for this album, as we had a personal connection to the venue. Is there any piece in particular that had inspiration from a story in a band member’s life? Most of our band members grew up in Nova Scotia, and the rest came here for a visit and decided to stay. The title, Old Peninsula is a reference to Nova Scotia, and is a lyric in the closing track on the album “Wish You Well”. Drew started to write “Wish You Well” while he and Danielle were on a road trip in the US a few years ago. It was a tribute and a reflection to home. The entire band seemed to gravitate towards this theme and we totally reinvented the song for the album. What’re you doing as a group next? At this point we are still riding on the excitement of the new album and we will be promoting it as much as we can this summer. We have festivals and shows lined up throughout the summer and fall in Nova Scotia and New Brunswick. A couple we are really looking forward to are Lunenburg Folk Harbour Festival, and Knotty by Nature festival at the Ovens Park. All of our upcoming shows will be posted on the website and on Facebook! We also have a wacky music video in the works. So stay tuned for that! Has the east coast been a good venue for art and performance? The east coast is absolutely a good venue for art and performance, which we attribute to the great community of artists and to the supporters of live music. 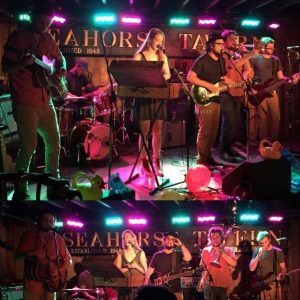 Although the number of music venues that genuinely support live music is dwindling there are some really special places on the east coast that are fostering a unique scene for musicians. And is there anything you want to say to your fans or the public? Thank you for the incredible support that we have gotten over the past few years playing on the east coast. We’re super proud of the new album and we hope you love it! Support local artists and live music! For more information on Caribou Run, you can check out their website HERE. « CHSR Top Ten for Week Ending June 16th.